Lightning McQueen fans will be thrilled to hear the Disney/Pixar Cars Truck Tour will make a pit-stop at the Phillip Island V8 Supercar Championships next weekend. 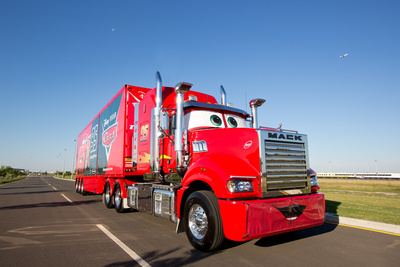 Disney-Pixar, Mack Trucks, Life Like Touring and V8 Supercars have joined forces to offer families and Cars fans, the opportunity to ride, race and play their way through a dynamic Cars franchise themed interactive zone. Phillip Island SuperSprint will become a miniature Radiator Spings on 15-17 April 2016. You and your children will meet Mack the Transporter in truck-size, along with the all-time superstar car Lightning McQueen. Enjoy Disney/Pixar's franchise Cars and the V8 Supercar Championships this April 15-17 April 2016. On your marks, get set, go!